Enjoy beautiful views of Mount Equinox at this newly renovated studio apartment. Relax and enjoy the views from the master bedroom with a brand new king bed, full bath and walk in closet. The views from the large bedroom windows are awesome mountain vistas! A loft above includes a new full and a twin bed. The open living space with vaulted ceilings give you a nice space to relax after a day of adventuring in Southern Vermont. A full kitchen has all you need to make a great meal from all you've collected from the local markets. Centrally located in Southern Vermont, you'll enjoy skiing at Bromley and Stratton Mountains, shopping at the outlet stores in Manchester, watching the Summer Festival Horse Show in Summer and fishing or floating the nearby famous Battenkill River. If you have a larger group, you can also rent the attached house next door that sleeps 10! Check out rental property 3961665 to see pictures. The studio is also available as a weekly or monthly rental, ideal for family and friends that love to ski, snowboard or ice skate! In the winter you can sled down the front hill. In the summer - there's a flat grassy field great for pick-up sports. The main living area features a high vaulted ceiling and fireplace, and the kitchen has everything you need to cook, plus an island with bar stools. The studio is equipped with HD TV and wireless internet access. Enjoy campfires in the outdoor fire pit. Kids will enjoy playing in the castle-themed tree house or sliding down the fireman's pole. If you have pets, or kids that act like pets, there is a 3 acre front yard perfect for pick-up games and running around. There's a 5-mile jogging loop around the local roads - most of them dirt. Just leave the driveway, start jogging, and just keep turning right until you get back to the house. Or walk 4 miles across the valley and up the other side to the incredibly scenic, high-elevation sheep farm. Grab a raft and float the Battenkill River. Within a mile, there are 2 bridges - Park a car at the south bridge and hitch a ride to the north bridge where you can "put in" for a really relaxing 2 hour river summertime float. The sun sets right over the mountains in front of the house that you can enjoy from the porch or the lawn. Walk a quarter mile to the Hill Farm Inn every Thursday night for the little-known, but highly attended locals night. Strangers are soon friends and you'll enjoy the restaurant in the newly renovated Hill Farm Inn. Then walk home without the worry of a drive. The property has 2 rental units, a main house and a studio apartment joined by a beautiful greenhouse. Heather is the REI brand ambassador for the Ragnar Relay Races. Driving an REI rig nicknamed Thor, Heather and a team of REI staff provide coffee, smores, an hammocks for thousands of racers each year. Her husband, Gordon is the President of Tool Factory, a technology company for education. He's our go-to guy whenever we need something fixed and makes sure that guests have everything they need for a welcome stay. It's the views! This property is truly a 4 season show with snow capped mountains in winter, migrating green growth up the mountain in Spring, lush green trees in Summer and a kaleidoscope of colors in the Fall. It's also the convenience. 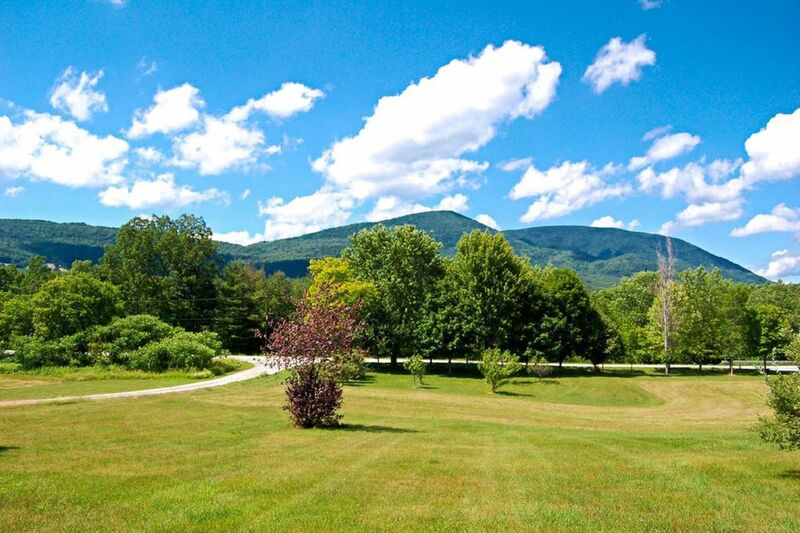 We have centrally located for easy travel to all Southern Vermont has to offer! The studio is above a three car garage (not part of the rental property). The first time we walked up the stairs to the studio, we were surprised to find such a spacious living area. With vaulted ceilings, a tiled wood fireplace with mantle, beautiful cherry kitchen cabinetry, this studio was awesome. The large bedroom with it's own walk in closed and full bath has three large windows that provide a beautiful view of Mt. Equinox. It's the views! Truly a 4 season show with snow capped mountains in winter, migrating green growth up the mountain in Spring, lush green trees in Summer and a kaleidoscope of colors in the Fall. We have fresh sheets on the beds ready for you! There is plenty of outdoor parking for cars or horse trailers. The fridge has a top freezer. We have a collection of spices for you to use in the carousel cupboard. Full Kitchen with microwave, dishware, cookware wine rack, spices and kitchen island. You'll find cards, games, candles and flashlights in the credenza in the living area. Lots of room to stretch out, play and enjoy the views. The bonfire pit is a favorite evening hangout. There's a deck off the dining room where you can enjoy the views. This property was overpriced. While the view was was very nice the accomodations were not. This rental was very disappointing for the following reasons: dirty oven, burn holes in the carpeting, taped hole in the screen door, broken towel rack in the bathroom, old food in the refrigerator, old, musty smelling furniture, no blinds on the windows only curtains that did not fit the windows when curtains were closed and rental unit overall was not cleaned very well. It was overpriced and it took nearly four days to get our security deposit back after numerous e-mails. The pictures of the beautiful view are accurate the pictures of the rental unit are not. We would NOT recommend this property. We stayed at this property for five nights to attend the Vermont Summer Festival horse show. It was a great location, about 15 minutes to the show and less than ten minutes to Manchester Center. The setting and grounds are gorgeous! The space was very roomy and for the price, we were happy with it. One small issue was that the apartments furnishings are a bit older and musty. Be aware that they do rent the neighboring house which is attached so conceivably you could have a large party come in right next door. Thankfully we had it to ourselves for the first two nights and then when three families did come, they were super nice and we had no issues. The hosts are extemely responsive and though they are out of state, attended to our needs very well. Overall, can't beat the price, space and setting! Amazing view, great space and attentive hosts! We stayed in a well designed spacious home with 3 adults and two kids. We had family staying in the big house and we still felt connected to them only a few feet away! Perfect for family reunions! Our home was as spacious as the larger property next door and we had amazing views in every room of the house! The only design flaw was that our friend staying in the loft upstairs with her kiddo had to come through our room to shower as the main bath is accessible through the master bedroom. Other than that it was great because she had access to her own powder bath downstairs. Our host, Heather, was more than accommodating and graciously gave us a late check out. Response time was super duper fast! We loved the fireplace and kitchen was well stocked. Just needed matches for more fire lighting! The property is so beautiful and it was perfect for the kiddos to enjoy the snow and snowtubing. Close enough to Stratton and good shopping and eating in cute Manchester. Would LOVE to come back!!!!! On Green Peak mountain, just a few miles north of Manchester, there are bat caves and rock quarries. The easy 1-2 mile hike up the mountain will lead to mysterious underground caverns and a wide chimney face that many rock climbers enjoy. There are multiple rock quarries, and even a swimming quarry in nearby Dorset. Sunderland is also steeped in history. It's home to the cemetery where Ira Allen is buried, of the famed Green Mountain Boys. Just hike up the street to see his burial place and explore all the interesting gravestones across from a historical church. After that go fly fishing on the Battenkill River or hike the river trail which is just down the hill. Visit Bennington for the Robert Frost grave and museum. Then drive further south to the fascinating Clark museum where some of the most famous artwork in the world is housed. We can also guide you to some little known local waterfalls.